Lindsay Wentzel studies false pregnancy in black bears as part of the Fralin Life Science Institute’s Summer Undergraduate Research Fellowship. Photo courtesy of Lindsay Wentzel. A black bear’s ability to give birth during hibernation — a time when food and other resources are extremely limited — has always puzzled scientists. 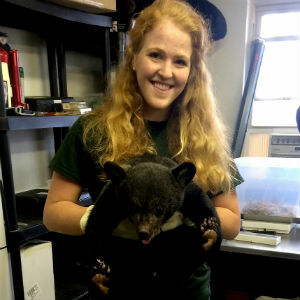 However, this summer, as part of the Fralin Life Science Institute’s Summer Undergraduate Research Fellowship (SURF) program, junior Lindsay Wentzel, of Yorktown, Virginia, is working with a team that aims to better understand black bear reproduction. Specifically, the team is trying to determine whether pseudopregnancy — the term for when a nonpregnant female produces hormones similar to those of a pregnant female — occurs in black bears. Working at the Smithsonian Conservation Biology Institute in Front Royal, Virginia, Wentzel has analyzed the progesterone and estradiol hormones in blood serum samples from 29 adult female bears: 10 pregnant that produced cubs, nine pregnant that did not give birth to cubs, and 10 nonpregnant. All samples were collected at Virginia Tech’s Black Bear Research Center between October and February for various years from 1989 to 2016. So far, they have found that, based on hormone concentrations, black bears do not experience pseudopregnancy. Previously suspected pseudopregnant bears did not actually show the same hormone profiles as truly pregnant bears. Instead, their results point to the conclusion that the non-cub-producing bears became pregnant but miscarried. “As conservation biologists, we need to actively promote the conservation of species and, in order to do so, we need a comprehensive understanding of an animal’s reproductive physiology,” said Wentzel, who is double majoring in wildlife conservation and fish conservation with a concentration in marine fisheries. Wentzel’s advisors are Bernardo Mesa, of Bogota, Colombia, a graduate student in the Department of Fish and Wildlife Conservation, and Marcella Kelly, professor of wildlife in the College of Natural Resources and Environment. Black bear mating season occurs from June through August, months with the highest food productivity. Virginia Tech Professor Emeritus Michael Vaughan, who studied bears for more than 20 years, and his team were the first to discover that the fertilized embryos arrest their development until mid-to-late November, when implantation occurs. This delay in embryo development allows black bears to carry their pregnancy and give birth while hibernating over winter.